U.S. Secretary of Defense Ash Carter told the Chinese defense delegation in Singapore that the U.S. will take appropriate action if China crosses the red line, i.e. further reclamation and militarization of the Scarborough Shoal in the Spratlys chain. 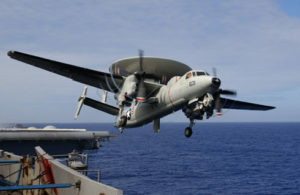 U.S. Adm. John Richardson boarded an E-2C from the carrier USS Stennis to inspect disputed South China Sea area. The Philippines and China have fiercely clashed over the Scarborough Shoal in recent years, creating numerous tense naval stand-offs. As China continues to make island reclamations in the disputed rocks, shoals and islands in the region, China’s military options have increased dramatically. Read Complete Article. Subscription Information. Current Edition.